While the red recording dot is almost always half cut, using any option in Movie Tweaks -> Time indicator will make a flickering value display there too. buffer indicator will be over histogram in all but 2 modes. Is this an M only issue? If not/yes, is this needed? I've clean up this, it substracts 160 and then later adds up 160, why? to detect current mode where screen_layout_menu_index has a value of 0/1/2/3/4 ( for top&bottom3:2 / 16:10HDMI / 16:9HDMI / bottom3:2 / bottom16:9 ) and adjust vertical offset as needed, but if I try the same in void show_mvr_buffer_status() it always says 16:9HDMI ( screen_layout_menu_index value of 2 ), hence I used a different test to determine current mode. Any reason for this difference? bottom 3:2 and bottom 16:9 modes are exactly the same, why? The issue appears to be on most cameras (not M only). You can integrate the countdown in the top bar with a LVINFO item (see bitrate-5D3 for an example). The 16:9 screen layout is for some external monitors (it moves the top and bottom bars a bit closer to the center, so you can see them on those monitors). Last time I checked this was 2 or 3 years ago, so it might be broken. I'll be able to try it next week (or maybe earlier in QEMU). I'll try to refactor it like that asap. I'd like to help out but I'm not a developer and have not been able to get around the current EOSM.202 build failing issue. Would it be possible to post your compiled file somewhere accessible for testers to check out? I won't try a pull request yet, I still like to try to port it to LVINFO but I did not yet find the time. It says that the file is no longer available. Tried your build and it is much better. 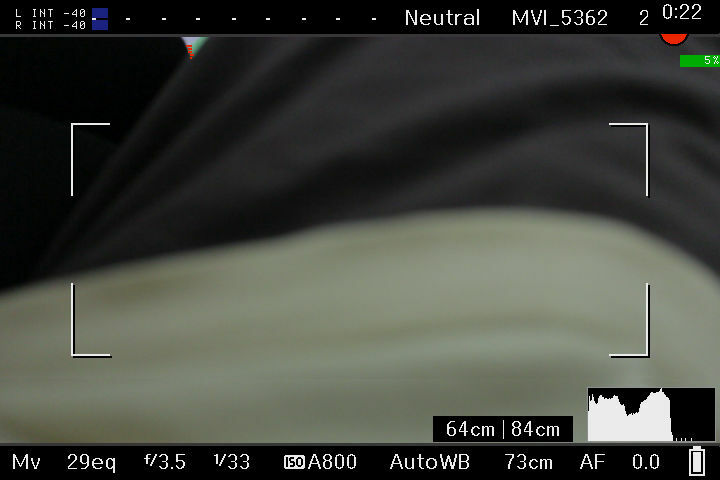 The red recording dot is still cut in half when recording starts but it is quickly replaced by the Movie Tweaks Time Indicator display. The fps display no longer fights with the Movie Tweaks display. Turning off Movie Tweaks will show the half red dot as before. I'll rather lose the dot altogether, there might be a way given the comments in code, and one can have STBY /REC info from the Tweaks to replace it.